Image caption The peace merch may already be on sale, but will the live performance match up to it? 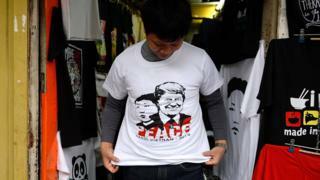 South Korea has lived with "hope" for nearly seven decades. Hope that war would not once again break out with its neighbour. Hope that perhaps the latest round of negotiations will yield results. Hope that this time will be different. The hope for a new relationship with North Korea waxes and wanes alongside the level of threat, but here in Seoul many people feel this latest round of diplomacy is the best chance they've had in a generation. Expectations of a clear outcome from this second summit between Kim Jong-un and Donald Trump are not high, however. Even Mr Trump has lowered the bar by saying he's in no rush to get North Korea to give up its nuclear weapons. So with that in mind, just what would success in Hanoi look - or sound - like? Let's take a look through the medium of song. Here's a list of appropriate titles which both sides could add to their playlists if they want to sing all the way back to Washington and Pyongyang. Let's start with the basics. What exactly does "complete denuclearisation" mean to both sides, and what does it look like? Yes, both Donald Trump and Kim Jong-un have signed an agreement pledging to denuclearise the Korean peninsula, but there's been a seven-month stalemate in talks because neither side can agree on who will give up what, and when. If both sides want to convince each other they're "in love" (as Trump has said) and it's not just Fake Love, then getting some kind of clear understanding of where these talks are eventually heading is a must. Senior US officials have said they want to move things forward with "very big bites". That, for example, could be Donald Trump persuading Kim Jong-un to stop making nuclear weapons or even put a cap on the number they could make. But that doesn't seem to be on the table yet. What is under negotiation is one of North Korea's main nuclear processing plants. South Korea says Kim would be willing to permanently dismantle the plant at Yongbyon if the US took "corresponding measures". It is likely that the North Koreans will want significant sanctions relief in return. So "step by step" is the kind of deal they have in mind. It is my understanding that the US wants independent inspectors to verify that the plant is no longer viable before there's any sanctions relief. That could take at least a year. But the plant is also not as critical to the nuclear programme as it once was, so getting rid of it will not end the nuclear programme. Both sides are likely to drive a very hard bargain for such a prize, and the US will not want to give away its main diplomatic tool - sanctions - too soon. Perhaps a realistic step, though also a high bar, would be some kind of timeline for the destruction of Yongbyon and even for North Korea to declare its other nuclear sites. This would lay out a path beyond this second summit, which is something the meeting in Singapore did not do. Of course this title had to be in here, as there is increased speculation about a possible declaration to end the Korean War. The fighting ended in 1953 and an armistice was signed, but not a peace treaty. Mr Trump has described his talks with Kim Jong-un as a "historic push for peace". He has also talked a lot about whether or not he deserves a Nobel Peace Prize. It may be easier for both sides to discuss peace rather than denuclearisation. A peace treaty is something North Korea has always longed for, and some kind of declaration could help build confidence between the two sides. It could be one of many actions which bring trust and help forge a new relationship - if both are indeed serious about doing so. Can second Trump-Kim summit succeed? To do this, Trump and Kim could simply declare an end to the war while in Hanoi. But here comes one of the many notes of caution: In real terms, it might not mean much. This would not be a peace treaty. That would need a signature from China and someone from United Nations Command. The US senate would have to discuss and approve a draft, and South Korea would also want to be involved. There has been a reluctance in Washington to offer any kind of declaration as there are fears it would give both China and North Korea grounds to complain about the 28,000 American troops in South Korea. The US envoy to North Korea Stephen Biegun stressed in his recent speech that the Trump administration would want a "complete understanding" of North Korea's nuclear weapons programme and also the "removal and destruction of fissile material, weapons, missiles launchers and other weapons of mass destruction" before it would consider peace. It's unclear that Donald Trump will take this hard line, or whether he will see an opportunity to make history. But it would certainly be quite a moment if it happens in Hanoi. Kim has told his people he will make their lives better, they won't go hungry and he will find ways to provide electricity. He also has a growing consumer class in Pyongyang which will not be happy if its income drops. He has painted a picture of a socialist utopia with new apartments, hotels, a ski resort and commercial facilities. He is a young ruler, and could be in power for many decades, so at some point he has to make good on his promises. If Kim does indeed want to turn his country into an economic rocket, as Trump described it, then he needs to do enough to persuade the Americans to stop hemming him in with sanctions. Washington is unlikely to do that until they have seen evidence that Pyongyang is willing to disarm. But they may have other enticements along the way. In South Korea, there are a number of salivating investors ready to hop over the demilitarised border and re-open a joint business park at the village of Kaesong as soon as they are allowed. There are also companies keen to restart tourist trips. South Korea may hope to ask for sanctions exemptions to restart these joint projects. Perhaps the US will dangle them as an incentive? This would certainly have the North Koreans singing in the aisles during their long train journey home. The US and North Korea struggle to know or understand one another. After decades of disrupted attempts at diplomacy, perhaps an agreement in Hanoi could see the two countries establish a more stable relationship. There is no US embassy in Pyongyang, but it seems there are discussions about creating a liaison office in the North Korean capital. A similar agreement was made in 1994. The US even signed a lease on a space and the North Koreans looked at setting up a site in Washington DC, but the plan was cancelled. There is no formal communication channel between Washington and Pyongyang. The US still relies on the Swedish embassy for consular services, and there is a North Korean mission to the United Nations in New York. A liaison office would make it easier to get information across and perhaps even narrow the gap in understanding between the Americans and the North Koreans. There may be other things which make it onto the agreement - such as cultural and sporting exchanges - which would certainly be seen as a success in Seoul. There is a lot of scepticism about whether or not the North Koreans are serious about this diplomatic outreach. Pyongyang is also still very wary of the Americans. Getting North Korea to discuss dismantling its nuclear weapons in this atmosphere of distrust will never work. There are also those who doubt Kim's intentions to give up what the state has described as its "treasured sword". It may be that instead of working towards disarmament, his true goal is to be accepted as a nuclear power. The orchestration and showmanship surrounding these staged summits cause some to question the validity of having them at all. But establishing both formal and informal diplomatic ties offers the US its best chance of ensuring that even if Kim has the weapons, he is not going to use them.